In an effort to create a template that can be used to design networks that are able to be flexible enough to deal with the current requirements of modern networks, Cisco has developed a number of different network architectures that can be used by network designers to develop these modern networks. The three architectures that were developed by Cisco include the Borderless Networks Architecture, the Data Center and Virtualization Architecture and Collaboration Architecture; this article gives a high level overview of these three architectures. In an effort to create a template that can be used to design networks that are flexible enough to deal with the current requirements of modern networks, Cisco has developed a number of different network architectures that can be used by network designers to develop these modern networks. The three architectures that were developed by Cisco include the Borderless Networks Architecture, the Data Center and Virtualization Architecture and Collaboration Architecture; this article gives a high level overview of these three architectures. 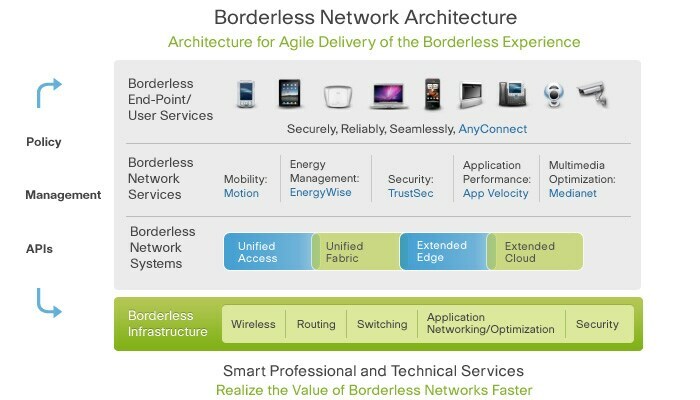 The fundamental idea behind the Borderless Network Architecture is to build networks that are able to exist without any perceivable borders; Figure 1 shows the graphically representation of the architecture. As shown in the figure, the main goal of this architecture is to provide the ability to “connect anyone, anywhere, anytime, and on any devicesecurely, reliably, and seamlessly.” Of course to provide this, a number of different pieces of the network must be put together to create this ability. All of this is built on top of a solid infrastructure that provides for a number of different borderless network services including Cisco Motion, Cisco EnergyWise, Cisco TrustSec, Cisco Application Velocity and Cisco Medianet. CleanAirImproves air quality by mitigating RF interference and protecting performance. ClientLinkWorks to increase wireless client performance in mixed environments. VideoStreamOptimizes the performance of video over wireless networks. Cisco Wireless LAN Planning and Design ServiceService that provides the ability to increase deployment efficiencies, scalability, and performance. Cisco EnergyWiseWorks by measuring, controlling, and reporting energy usage throughout the enterprise. Cisco Services for Energy ManagementHelps enterprises establish efficiency benchmarks, improve IT infrastructure, data center and facilities efficiency, provides energy cost savings, and helps speed the deployment of building energy management solutions. Cisco Application VelocityProvides technologies focused on accelerating application performance. Cisco MedianetProvides an architecture with the goal of creating a pervasive media experience by developing smarter network, endpoints, shared media services, and cloud services over an end-to-end IP architecture. The main goal of the data center and virtualization architecture is to increase business value through technology innovation, system excellence, and solution differentiation. This is detailed through the Cisco Data Center Business Advantage framework; an illustration of this is shown in Figure 2. Data Center VirtualizationIncludes a number of different technologies and services that provide the ability for the network to bring the network, storage, servers and virtualization solutions closer together. Support for all server form factors and vendors through comprehensive flexible networking options. Data Center Management and AutomationProvides a mechanism to take advantage of management automation to allow networking staff to use their time most effectively. Cloud ComputingSupport for the rapid deployment of emerging cloud based solutions is possible through a solid infrastructure that is provided by Cisco solutions. Many of these solutions are integrated into the hardware, software, and to each other to make their deployment as simple a task as possible. As the business environment continues to evolve, it is vital that organizations keep up with the different moving parts in order to not get behind all of their potential competition. One of the key components that can be used to maintain this pace is to ensure the collaboration between all of the different parts of an organization. This is not only helpful in that it maintains a basic layer of communication, but it can also be leveraged to ensure that application, products and services are integrated together in the best way possible to give the best end result. Users are empowered when they have better communications and access to information that they can use. Collaborative applications can make real-time information available to this new class of empowered users. A collaborative community can be defined to support a common set of goals. It takes a combination of technology, applications architecture, business process, and strategy to achieve this type of collaborative environment and to meet all of the potential goals that can be reached with it. Network InfrastructureThe method of network infrastructure deployment can be selected by the type of service being implemented. For example, Software-as-a-Service (SaaS) is currently being implemented as an off-premises (on-demand) solution more and more for services like email, chat, and instant messaging. While this type of implantation may work well for these services, other services are better implemented with an on-premises solution. Integrated Network-Based ServicesWhen deploying services using a distributed model, it is possible to retain the greatest amount of flexibility and have the best solution for in terms of functionality and cost effectiveness. These services can be deployed and integrated closely with each other in order to have the best experience possible. ApplicationsIt is important that the implemented applications are able to be used and give the user the best experience possible. The application block is able to provide this functionality by supporting all different types of applications, whether they are standard enterprise application or highly integrated collaborative applications. In order to implement a good solid network design, it is important that a structure be in place to account for the different common design mistakes that can and are made. Using the different design architectures that are made available by Cisco enables the network designer the ability to avoid these common mistakes and to implement the best solution and thus the best design possible at the start; this then enables the network to grow easily and be able to adapt to future demands. Hopefully this article has given you a good overview of what the Network Architectures for the Enterprise can do, and makes you aware that they do exist and can be freely used to implement the best design.